Use UL approved extension cords specifically designed for outdoor lights. Then, be sure to check the holiday lights package for this, how many strands to connect and if there are any restrictions. 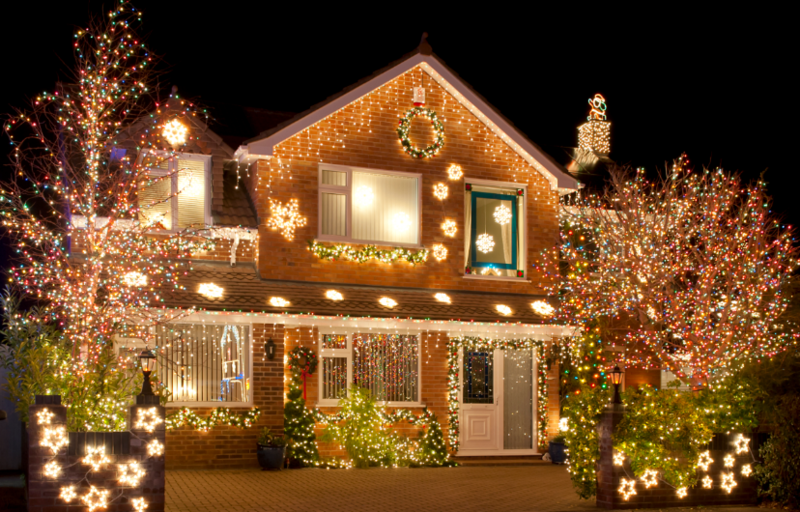 Whether your holiday lights are brand new or two years old,be sure to check them. Frayed or damaged lights are a big no-no. All it take is one defective strand to cause a safety hazard or ruin your entire holiday lighting design. If not hung properly, holiday lights can damage your gutters. Attach the lights to your gutters using an all-purpose light clip. Lights can be hung pointing up or down as long as they are clipped in the same direction. If you’re hanging lights to your tree, use a light-hanging pole – a great alternative to a ladder. This is a safer option that is also easy and won’t hurt your back every time you need to move ladder in the right spot. If you’re hanging lights from high places and need to use a ladder or hop up on the roof, ask a friend, family member, or neighbor to help. You need a spotter to make sure the ladder is still and you aren’t in any danger you might not realize. For more roofing tips or home care services to keep your roof healthy, turn to Landmark Exteriors! Whether you need a maintenance plan or just a last minute-repair, our team has got you covered! To speak with on one of our professional staff members, give us a call at 203.838.3838.